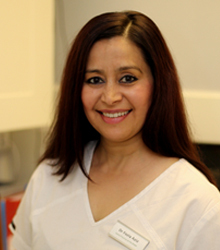 Fozia bought her first Dental Practice in Winchmore Hill in April 2012. This was a natural move after having gained vast experience in all aspects of General Dentistry in over 20 years of working in family based practices in London and the South-East of England. Fozia is proud to be the head of a handpicked team of highly motivated and experienced professionals. Dr Fozia Aziz leads a team of highly experienced dentists who have added to the scope of dentistry provided at Dentist of the Green. Having graduated from the Royal London Dental School, with first class honours in 1990. She has developed her skills over the years, expertly treating patients in all aspects of general dentistry and is especially able with nervous patients giving them the time and patience needed. Together with you she can plan what you would like to achieve with experts we have within the practice. Over the years Fozia has developed a special interest in cosmetic dentistry, creating beautiful smiles with crowns, veneers and tooth whitening systems both Laser and home, bringing these skills with her, she is committed to improving both the health and appearance of your smile. Her keen aim is to ensure every patient has the best service they request for each and every appointment. She has developing relaxed and caring patient led treatments. Fozia is a professional and experienced dentist having worked with several health authorities since qualifying. She is an organised and self-motivated practitioner, with a caring, outgoing and friendly attitude, who enjoys whole patient care, especially progressive dentistry. She attends many courses to be sure to bring current up to date methods, materials and visiting clinicians, to maintain a high quality service to all who attend Dental Practice on The Green. Fozia is committed to maintaining and updating her skills with regular attendance at post-graduate seminars and courses. Facial Rejuvenation training with Cosmetic Courses with Plastic Surgeon Dr Adrian Richards in Princes Risborough. As part of The Insiders Club, a Dental Team Development group, she further aims to build the practice towards being and integral part of the community in West Hampstead by both, providing top notch dental services, whilst becoming a lively member of the community and beyond. Her aim is for a philanthropic outlook for the practice long term. By investing in both the Practice and her staff she is committed to growing Goldhurst Smile as a centre of excellence where you will continue to be provided with the best of what modern dentistry has to offer. So far, she has built her Team to include a Specialist in Periodontics and two practitioners who provide Endodontic treatment and a dentist who can offer both conscious Sedation and Adult braces, thus reducing the need to travel further afield. Outside of work, Fozia has a keen interest in current affairs, and is an avid follower of sports especially football and cricket. She has travelled extensively visiting much of the world and hopes to complete this interest by visiting at least one city in every continent.